Prices are in US dollars. Sales Tax may be added. Prices subject to change without notice. Download the CONCEPT III brochure pdf. CONCEPT III is a complete web- or cloud-based Integrated Library System (ILS). Use any computer or device that has a browser and an Internet connection. That's pretty much everything we use nowadays including smartphones and iPads. 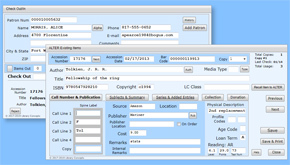 CONCEPT III includes the Public Catalog (OPAC) that anyone can access. Not only can your patrons access the catalog anytime, anywhere, BUT they can create HOLDs, list what they have checked out (and overdue! ), even review their checkout history. 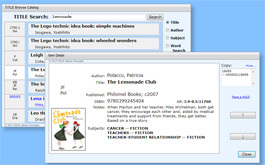 Process incoming materials (quick cataloging with the instant ISBN LOC searches [qLOC]) at the library, or anywhere, for that matter. Manage your check-in and check out with or without a scanner. Everything 'circulation' (fines, overdues, holds, add patrons) is handled conveniently on one screen. Inventory your collection with any number of helpers using their laptops, phones, and tablets, all at the same time! DOMINATE your Inventory with CONCEPT III!